(Photo: Kim Cain)Hands raised at the September Pentecostal World Fellowship conference in Kuala Lumpur, Malaysia. A global leader in ecumenical movement has alerted participants to the forthcoming World Council of Churches 10th Assembly in Busan, to be aware that they meet in rapidly changing times for world Christianity. He says there are consequences for all church institutions, including the WCC itself. Rev. Wesley Granberg-Michaelson, in a book timed to coincide with the gathering, says so fundamental are the changes now shaping the Christian world that the WCC will need to "commit to deep change." It they don't he says they could remain largely isolated from the dynamic and growing parts of the Church, especially from the global South. Cover of "From Times Square to Timbuktu," published in 2013. His perceptions are likely to strike a chord at when the World Council of Churches meets in Busan from October 30 to November 8 for its 10th Assembly, the highest decision making body of the grouping that represents some 560 million Christians. Granberg-Michaelson, is a former member of the main governing body of the WCC, its central committee, and worked on the staff of the organization for six years, originally as director of the Church and Society programme. 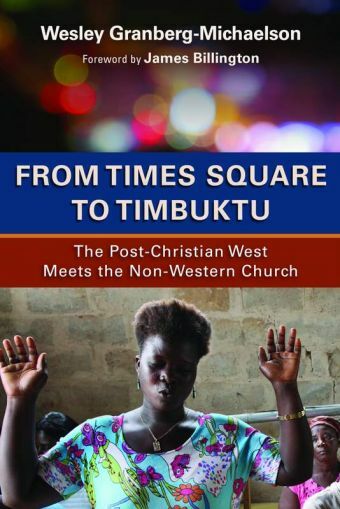 He says the book, From Times Square to Timbuktu, is an attempt to describe the "growing gulf" occurring in world Christianity, primarily between the burgeoning Pentecostal and evangelical churches in the global South and the declining churches of the global North. Noted scholars in world Christianity like Lamin Saneh, Philip Jenkins, and Andrew Walls have given the book strong reviews. Granberg-Michaelson says a visible sign of this gap is revealed most clearly in the weak relationship between the established ecumenical institutions such as the WCC and what he calls the "fast growing Pentecostal, energetic evangelical and highly contextualised emerging forms of Christianity" in Africa, Asia and Latin America." He notes his concerns for the life of the WCC arise as a "fair and loving critique" of an institution for which he has great admiration but which seemingly is "hindered in directing its energy and resources in creative responses to the dramatically changing landscape of world Christianity." Says Granberg-Michaelson, his worry for the WCC, as well as other ecumenical bodies, is that they are "almost completely separate" from those parts of the world Church that are clearly reshaping the Christian world. These separate parts of Christ's body, he asserts, mutually need the gifts of one another in order for future Christian witness to flourish. (Photo: Kim Cain)Rev. 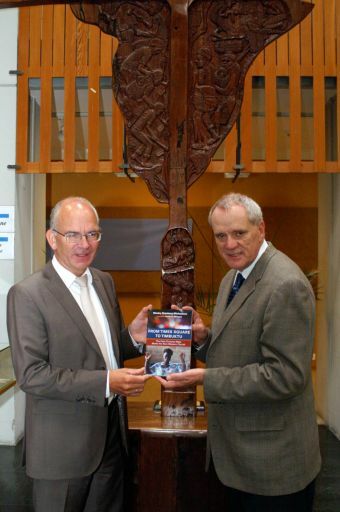 Hielke Wolters, associate general secretary of the World Council of Churches holds the book "From Times Square to Timbuktu" with its author Rev. Wesley Granberg-Michaelson before the image of Africa set against the cross of the Harare, WCC Assembly at the Ecumenical Center in Geneva. The picture was taken during the September 2013 meeting of the International Committee of the Global Christian Forum in Geneva. Providing a safe space for these worlds to come together is part of the required bridge building, says Granberg-Michaelson. He notes that the Global Christian Forum - an enterprise originally launched by the WCC is the most promising initiative for this so far. Granberg-Michaelson is a member of the GCF international committee. At a recent symposium in Geneva, Granberg-Michaelson and WCC general secretary Olav Fiske Tviet each spoke about the complementary roles of the WCC and the Global Christian Forum in one the ecumenical journey. Quoting figures showing the force of numbers behind this change he says, "The growth rate in the Pentecostal, charismatic and renewal movements of Christianity is nearly five times that of the overall growth of global Christianity, dramatically changing it composition and its theological diversity." ● In 1910, 66 percent of all Christians in the world lived in Europe; in 2010, only 26 percent lived there. ● In 1910 only two percent of Christians lived in Africa, today nearly one in four Christians of the world is African. ● In 1910, Europe and North America (the global North) contained 80 percent of all Christians – today it is only 40pecent. ● In 1970, 5 percent of Christians were Pentecostal or charismatic. ●Today that figure is 25 percent, equalling about the same number as all those in the member churches of the WCC. The statistical centre of gravity of Christianity, he says, has today moved from near Madrid in 1910 to Timbuktu, in Northern Mali, Africa. "It is the most dramatic geographical shift in a century in the 2,000 year history of Christianity." 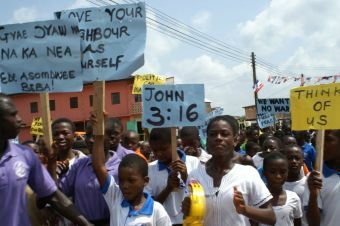 (Photo: Kim Cain)Christian children demonstrating near Accra, Ghana during the presidential election in December 2011. As well as Africa, he says there has been profound growth of Christianity in Asia (especially China, Korea and India, and more recently Mongolia, Nepal, and Cambodia). 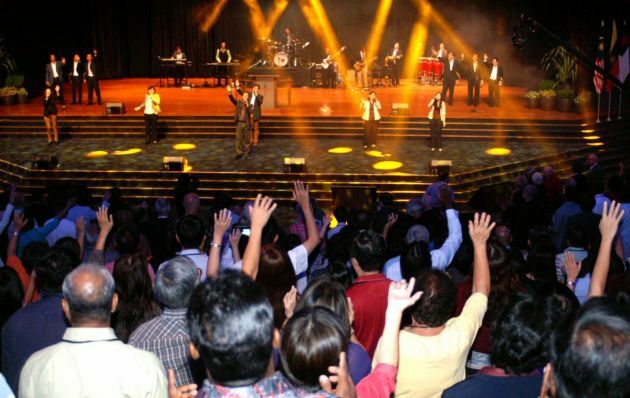 There has also been a growth of Pentecostalism in Latin America where in the city of Rio alone about 40 new Pentecostal churches open every week. This rapid change is now also coming to the shores of the global North through immigration, "which pleads for radical attentiveness" by church authorities there, Granberg-Michaelson says. This revolution in Christian demography, he notes, is a fundamental challenge to the very notion of church unity. There are some 43,800 Christian denominations in the world, and the WCC membership is around 350 churches. Even the institutional ecumenical structures with groups such as the WCC, the World Evangelical Alliance and the Pentecostal World Fellowship reflect the "separate worlds in which world Christianity" currently lives, which he likens to "ecclesiological apartheid." Granberg-Michaelson concludes that "The body of Christ through the world is undergoing massive shifts...with new divisions that mock the promise of unity given by God. "My hope is the WCC can fundamentally transform itself in order to play a key role in today's pilgrimage of Christian unity."" Speed-up and make it easier for Pentecostal and evangelical based churches to join the WCC, with their eventual participation and strength to have a constructive impact on the culture and programs of the WCC. For several years Granberg-Michaelson has also proposed that ecumenical organizations move their offices out of Geneva, one of the most expensive cities' in the world, to the global South "sending a dramatic message that ...recognises the dramatic changes in world Christianity." However, he now says he recognises that the WCC's governing body has made understandable decisions to leverage their building and land in ways to strengthen the financial sustainability of the organization. "All these steps would face serious resistance," says Granberg-Michaelson, but "in my judgement, this focuses the choices before the WCC as it approaches Busan," he writes.